The Kobs were handed over to a Ugandan delegation led by the minister of Works & Transport Monica Azuba Ntege towards 9pm on Tuesday night April 16, 2019. The two planes are part of the four CRJ900 aircraft ordered by Uganda National Airlines Company in July 2018. The CRJ900 jetliner is fitted with the ATMOSPHÈRE cabin in a dual-class configuration with 76 seats, including 12 first class seats. The Uganda Airlines Chief Executive Officer Ephraim Bagenda noted that they are thrilled to commence operations with the world’s leading jet. “We are look forward to providing the most modern passenger experience in regional aviation to the people of Uganda and across Africa,” Bagenda said. Uganda Airlines choice of selecting CRJ900 jets fitted with the atmosphere cabin making it the first operator in the region and Africa with enhanced cabin experience. The aircrafts have successfully been registered by CAA as 5xkob and 5Xequ. 5X is the registration for aircraft domiciled in Uganda. Speaking at the handover ceremony, minister Azuba said government realised that foreign airlines are not fully dependable and it therefore decided to revive the Uganda Airlines. The recruitment of staff started in September last year and over 12,000 applications were received. Meanwhile, Civil Aviation Authority wants more land for the expansion of Entebbe Airport so that Uganda Airlines gets its own Terminal. While meeting the Committee on physical infrastructure on Tuesday, CAA officials and a team from Ministry of Works and Transport, proposed that the passenger service charge/tax of 18% on every ticket be removed so that Entebbe Airport competes favorably with other Airports. 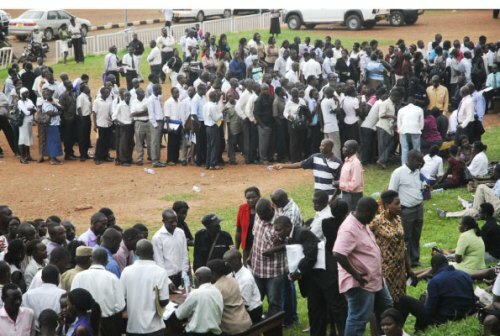 read: Where are Uganda’s graduates?